Thanks to a 'continental drift', we have been MIA on the blog for a long long while. Yes, we are now on the other side of the Pacific ocean - which does not bode too well for our waistlines (you must see the portion sizes here - HUGE!) but yayy to new foodie adventures!!! 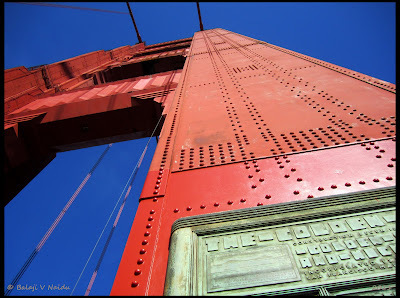 Mandatory pic of the Golden gate bridge - check. The San Francisco Bay Area, where we now live, is like an 'amreekan' version of Bangalore - there's the Silicon Valley, there are the desi geeks and there are the restaurants - oh! the restaurants - of all shapes and sizes, from every corner of the world, where one can savour a different cuisine for every day of the month. No wonder we are so tummy-happy with the move! A frantic google search on an empty stomach in San Francisco pointed us to Mama's, located in North Beach, the Italian quarter of sunny SF. 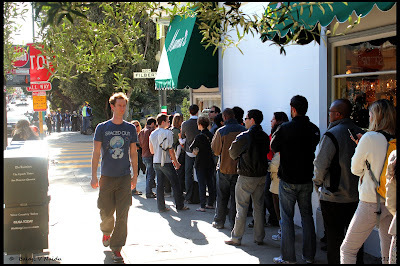 Online reviews warned of a looong wait for a table and boy- where they right or what! We waited a good 40 minutes outside on a Saturday mid-morning - our hungry tummies growling from bass to baritone. 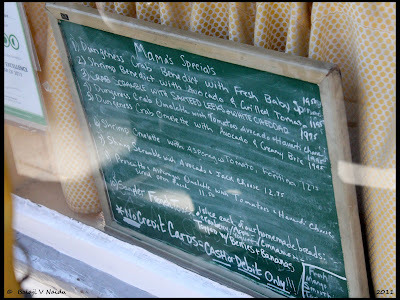 Not to mention the tempting menu on the window (torture- I tell you) and the smell of toast and eggs and other good things wafting out - I was wiping off my drool from the sidewalk . The tiny but cosy restaurant was done up in cheery colours to match the holiday season and was full of happy, chattering folks (must be the food - always a good sign!). The orders are taken at the cash register but making up our minds on what to eat was no easy task - everything sounded yummy! 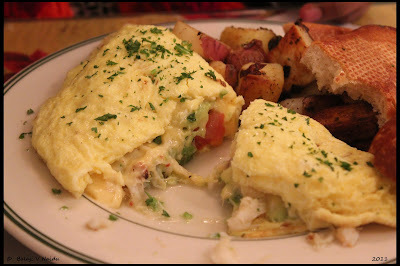 M'omelettes (short for Mama's omelettes) or benedicts? French toast or pancakes? How about one of each? Thankfully this foolishly sanguine idea was promptly dismissed in the interest of errrm....health, shall we say? The chocolate cinnamon french toast for Balaji came with heaps of berries and bananas and gooey chocolate syrup drizzled on top. Soaked in eggy goodness and dusted with sugar, it looked like it would send one into a sugar rush lasting for days. Surprisingly, it wasn't overpoweringly sweet- just the right degree of sinful goodness. Being the inquisitive Indians that we are, we could not help but unabashedly look at tables around us to 'check out' what others were having. 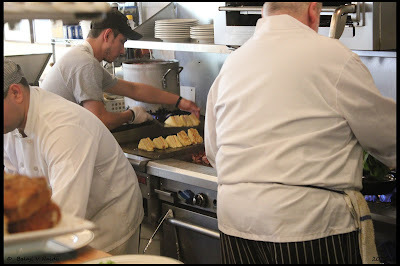 We learnt that the Monte Cristo (turkey breast and baked ham sandwich, in cheddar and havarti cheese bread dipped in egg, grilled and served with homemade jam) is a popular lunch option here (Mama's is open for breakfast and lunch only). 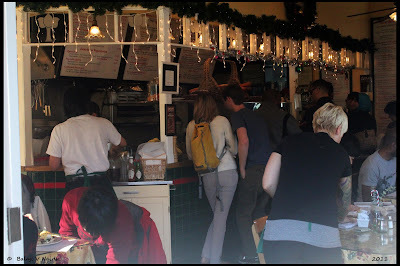 We also heard of (and promptly noted down) some other popular restaurant haunts in the city. What a wealth of info some discreet eavesdropping can get you! Warning - This stunt to be performed only by experts. 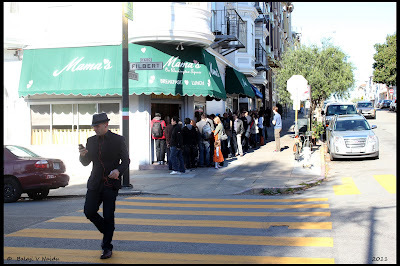 Despite being packed, service at Mama's is prompt and quick. The waiters are well-informed and courteous and the ambiance, warm and welcoming. 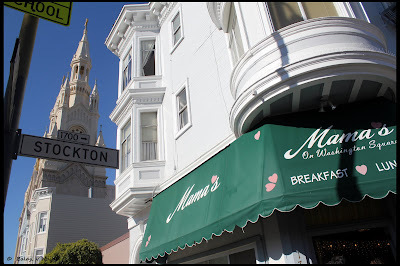 Mama's is a lovely nook of North Beach to refuel after a jaunt in the city. There's always the longish but pleasant walk all the way to Fisherman's Wharf to work off all those calories later! ........................................that the Dungeness crab is named after Dungeness, Washington where the US West Coast's first commercial fishery, mainly producing these crabs, was built in 1848? .......................................that French toast is supposed to taste best when made from day-old or leftover bread? 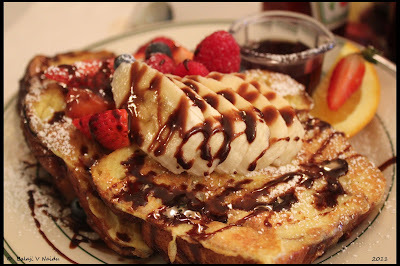 In fact, French toast is called pain perdu which means "lost bread" in French.